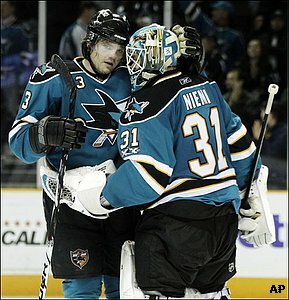 Sharks fans know Douglas Murray has a love for good restaurants. Over the years, he’s listed fine dining places such as The Plumed Horse in Saratoga, Bouchon in Yountville (near Napa in Northern California’s Wine Country) and the Slanted Door in San Francisco’s Ferry Building as his favorites. Not only does Murray like to eat well, he’s got a knack for the hospitality industry. Murray has a bachelor’s in hotel management from Cornell University and co-invented a hands-free beer tap with several friends from Cornell. So no one should be surprised that the 30-year-old defenseman enjoys spending time in the kitchen. “When I have time,” Murray, who doesn’t have a lot during the hockey season, said. Another taboo for chefs is using a microwave oven. Studies have shown that microwaving food destroys much of the nutrients and causes problems with the immune system. Murray said the only time he uses the microwave is to make popcorn. So what does Murray like to make? “I’d say steak,” he said. But he does a few more involved items besides a steak. “Lobster tails with champagne sauce and risotto,” Murray added. However, don’t pin him down for a specialty item. “I’m not very good for cooking anything in particular,” Murray said. “Every time I cook, I try something new. I like to know a little bit of everything. Of course, Murray has cooked for his teammates. Those who’ve tasted his culinary offerings include Ryane Clowe, Joe Thornton and fellow Swede Niclas Wallin. Like any good cook or fan of the culinary arts, Murray likes to watch the Food Network and the Cooking Channel. His favorite shows include “Ask Aida” and “FoodCrafters,” which are hosted by Aida Mollenkamp, who, like Murray, went to Cornell University and studied hospitality management. When Murray is done with hockey, he’ll be in the culinary industry. “You’ll definitely see me being involved or owning a restaurant,” he said. But don’t expect to see Murray in the kitchen or with his own television show. There will be no “Crankchef” or “Cooking with Sir” (takeoffs on his two nicknames). Murray’s offensive stats this season (a goal and seven assists) won’t turn people’s heads, but two of his defensive stats certainly have made people notice. Entering tonight’s game in Detroit, Murray leads the team in hits (124) and is second in blocked shots (102). In fact, Murray set a team record with seven blocks on Feb. 5 at Boston. Who leads the Sharks in blocks? Try Dan Boyle with 113. Everyone knows he eats up minutes (26:48 average on-ice time is second in the National Hockey League) and is an offensive force (tied for 12th among NHL defensemen with 36 points and is fifth in shots with 167). But earlier this season, Boyle tied his own Sharks record (since broken by Murray) with six blocked shots on Oct. 16 against Atlanta. San Jose begins their three-game road trip today in Detroit at 4:30 p.m. 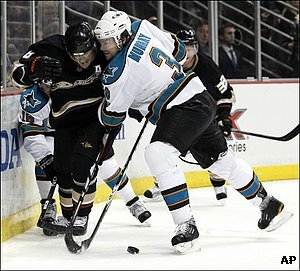 The game is available on CSN California, 98.5 and 102.1 KFOX and the Sharks Radio Network and on www.sjsharks.com.